Naturally, they just HAD to get all dressed up for the occasion. 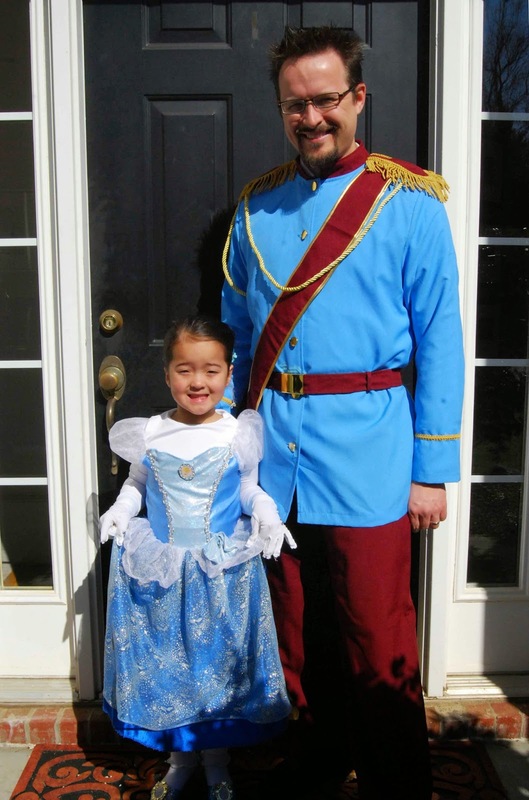 Good thing we just HAPPENED to have a Cinderella costume and Prince Charming costume in our closets.... Hee, hee, hee....! (You might remember them from our Halloween on the High Seas Cruise, a couple of years ago). Katy reported back to me that she LOVED the movie!! Shocker, I know! Apparently, though, it's a pretty emotional movie. At least to a five year old. There is one scene where the *Spoiler* Stepmother smashes Cinderella's glass slipper and Lil' Miss got really teary eyed and sad. After the movies, the duo went out for lunch. Subway- Katy's choice. So funny what kids choose! Both reported back to me that they had lots of fun and would like to do it again, soon!